Check the settings in the file manager module; it draws the desktop by default. OH ... OK, thanks PackRat. EDIT> YUP, that did it. I've been using a stable/testing/unstable/experimental frankenstein for years now. It's awesome. I missed this. Jealous, I posted my sid/Enlightenment/Wayland failure in another thread, I think. Openbox is a dead project. Do I understand correctly, when Wayland will be default on Debian (any guesses when that may happen? Within 5 years? ), there will be no #BĹ with openbox+tint2+conky? So far I read about Wayland, most people tend to prefer to use it in comparison with X11, so I guess there will be no such controversies like with switching to systemd. I thought we had already decided to use sway? when Wayland will be default on Debian (any guesses when that may happen? Within 5 years? ), there will be no #BĹ with openbox+tint2+conky? 5 years is a long time. Who knows what this project will look like then? Personally I enjoy the menu flexibility of Openbox, but I'm sure pipe menus, for example, could be implemented in other ways if we ended up with some other WM. With the glacial progress, missing drivers, and feature-incomplete status of Wayland, there is little to no chance it achieves default window manager status in buster (2019). Assuming it makes default in bullseye (2021), applications will still provide X11 compatibility ("baked in" to GTK3 and QT5, and required for GTK2 and QT4 toolkits). Furthermore, "default" status does not mean X11 is obsolete or even retired. Like sysvinit, it won't disappear with the new default choice and is likely to remain the default for derivative distros embracing older window managers. It is too early to declare sway the heir apparent to openbox. I have my doubts all blackbox clones will be defunct simply "because Wayland". Given the time frame, choosing a replacement now without evaluating all options including those under development seems to jump the gun. Pretty sure HoaS wasn't being serious. Not so sure. HoaS made his suggestion before and wasn't apparently in jest then. Just ensuring this is not the only idea bouncing around the echo chamber. @HoaS - Serious or not? Not serious at all, sorry for the confusion. I have no strong opinions about any putative Wayland-based window manager but if pushed I would lean towards Weston — it looks and feels a lot like Openbox, has a built in panel (that shows the names of the Blade Runner Replicants if you right click on it, no idea why) and it is the reference implementation of a Wayland compositor. Anyway, as far as I am concerned the choice of window manager is a cosmetic decision, on a par with choosing thunar or galculator rather than the alternatives, and not really critical at all; the fundamental spirit of the project — that of a simple, easily customisable, low overhead desktop — is the important thing. HoaS, I for one did not take your slightly provocative humor seriously for even one second, but you did get me to go look at sway. This in turn got me looking at i3. Well I've been using various forms of Linux since 2003 and have sampled numerous DE's and WM's but I have never given a tiling WM a really good shakedown. So can you guess what is going to happen next? Yes, a Linux user of 14 years is about to give a tiling WM a more than cursory test drive for the first time ever. So you see, one never quite knows what their words are going to provoke. @Sector11 - Thanks for the Archbang reference. I was hoping the stack would be Wayland:XWayland:Openbox with full XServer functionality to the window manager, but this is the first confirmation I've seen. Anyone know if XWayland can also provide window alpha-transparency without using an Xcompositor (like compton) in that stack? @HoaS - Thanks for the clarification. @Anaconda - Discussions like this inspire me to experiment too. I installed i3 to see what I was missing after learning it was both a tiler and a stacker. Visually/graphically - I prefer the negative space stackers offer. De gustibus non disputandum est. I installed i3 to see what I was missing after learning it was both a tiler and a stacker. That was one of the things that got my interest too. It handles floating windows in a way that seems "normal" to me. I also found that it is fairly well documented. Visually/graphically - I prefer the negative space stackers offer. Then you might like i3-gaps. I have not tried it yet but it looks like this can be configured per workspace. Regarding the original topic of this thread, I thought about checking out Wayland and maybe using sway with it, as mentioned by HoaS, but after looking at where they both stand development wise I decided to stick with X11-xorg and check out i3. Doing it on Debian testing-stretch as it rolls towards becoming stable will be enough adventure for me. I'll try it in virtualbox first and play around with it for a couple of weeks. If I end up with something I like well enough after tweaking it I'll save the configs and install it on metal for daily use. Thanks for the heads up. Didn't discover this feature... will have to play some more. ^it's not a feature of i3, it's a fork of the original i3. also maybe this is interesting. WHY openbox "won't survive the switch to wayland"? what's the technicality that makes dana jansens say things like that (i assume she really did)? will there actually ever be a switch to wayland, or will Xorg/wayland just be more user choice? isn't it very far way still (even if fedora is already using it)? Simply put: Openbox is programmed against Xlib; Wayland does not use Xlib. If you do some research into what Wayland actually is (i.e. not just "the new 'display server'" (which it isn't)), it will become clear. GNOME already made Wayland the default option. I don't know what others are doing, but I imagine that eventually it will be the default, with all the big players pushing for it. I guess this depends on what you need/want/mean. GNOME is already usable (I'm typing this from a Wayland session I've been running for a few months now, without issues). KDE is almost there. Enlightement has a fully working Wayland session, as far as I know. Cinnamon, Mate, Xfce, Budgie desktop and LXQt are the ones holding out still, of which at least Budgie desktop has plans to eventually move to Wayland. I don't know about the other ones. In any case, X is still going to be there for a long time. You don't have to use it just yet, if you don't want to. As Unia pointed out, the design of openbox is interdependent with the X11 design. Not just a complete rewrite, but a complete redesign is necessary to switch to Wayland. When Jansen says "it won't survive" I take her to mean no one on the current dev team is committing to that project. Openbox (like most window managers) is designed with server-side decorations. While Wayland does not require client-side decorations, Weston is designed that way (showing a GNOME 3 design bias) and there is no server-side reference implementation. A server-side reference implementation would have made *box adaptations that much easier. As far as I can tell, KWin is the only one to venture into the uncharted territory of server-side decorations in Wayland. As for Xorg/Wayland, that will be a choice for stretch, buster, and bullseye: at least six years. Why? Given GNOME/mutter/wayland has yet to reach feature parity with X11 and the size of that (non-trivial) todo list, there is no way it can replace X11 for buster (the soft freeze is expected in a year and a half). Even when Wayland matures to default status, that release will keep X11 as an option: bullseye is the earliest release that can happen. Note that Fedora 25 offers X11 both as a choice and a required fallback in some instances. I expect this to be the case for years to come. Wayland is certainly usable now with the right hardware (not legacy) and drivers (nouveau not nvidia). To those users I say "thank you" for beta-testing a product I won't employ for a long time to come. As a default with X11 parity it is still years away. Do not worry guys, as long as Linux, or some equivalent is around. We will be fine. unia & cpoakes, thanks for the detailed answers. afaiu wayland takes over at least some of the tasks that are the windowmanger's on a classical Xorg setup. so maybe the question "I see the big DEs, but what about minimal wm setups?" isn't quite correct. anyhow, looking at https://wiki.archlinux.org/index.php/Wa … top_shells there seem to be a few projects. however, i notice that they're practically all new names! The Wayland architecture integrates the display server, window manager and compositor into one process. Most KDE projects are tightly integrated, so even if they get it working, the code will most likely not be reusable in smaller projects. 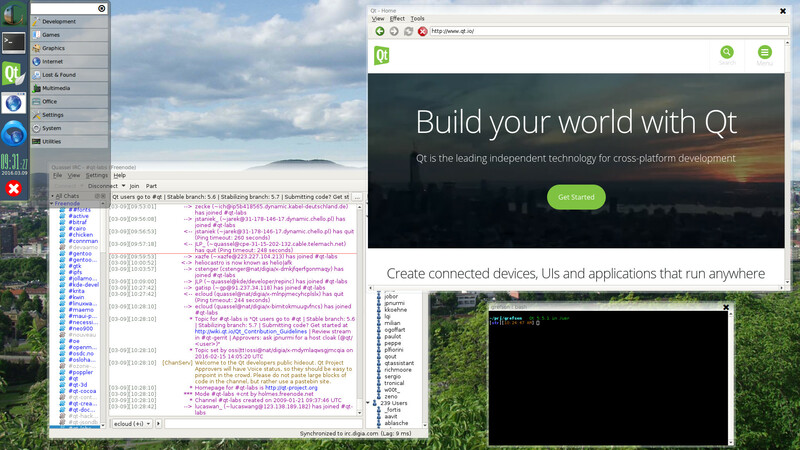 But aside from the KDE implementation, the Qt team has been working on a pure Qt implementation. They introduced it here and built a proof of concept miminalist DE that uses server-side decorations, screenshot. My impression is that they take this project seriously (the compositor library), because their compositor is used in many embedded system GUIs. I don't expect it to be hard to add all the Openbox behaviour on top of it. It will have to be reimplemented, of course, but it should take much less time than the original project, since Qt is much easier to develop with than glib and Xlib. The bulk of the Openbox code draws textures and gradients, creates buttons and menus, has custom data structures to store colors and images etc. All this can go away when using a sane window rendering API, as offered by Qt. The code should be much cleaner too. Here is an older demo of theirs from 2012: https://www.youtube.com/watch?v=_FjuPn7MXMs If it can be used to build *that*, a box-style design should be a piece of cake. ^I like it! Seems a good candidate for recreating *box WMs on Wayland. I note the API is still experimental (not stable). Devs would need be prepared for breakage and recoding to cope with that evolution. As for the QML interface, I have reservations. Experience with GNU Guile put me off interface specific programming languages. While useful to quickly create and prototype new implementations (where the original devs have a high degree of familiarity with the language), they can be a pain to modify or maintain (when subsequent devs have a low degree of familiarity). They "act like" or are "based upon" other languages with enough differences that modifying source often introduces surprises not quickly resolved. Glad to see there is a C++ interface even if it requires more verbose coding. I agree on QML. Even a C/C++ API can be troublesome if the abstraction does not expose enough of the lower layer for the same reasons (GTK comes to mind). But in my experience, most Qt libraries are well designed and offer a lot of flexibility. As for the API status, it has actually been stable since Qt 5.8. Qt versions from the same major release (as in 5. *) guarantee API and binary backwards compatibility. ^Glad to hear about the API stability.